It is a hard task indeed to follow several movies over the last few months that managed to achieve a degree of originality seldom seen before. Animal Kingdom, The Square, Winter’s Bone and The Secret in Their Eyes gave us some new people to watch in new situations. THE TOWN is not a bad movie by any means but we’ve seen it—many times. 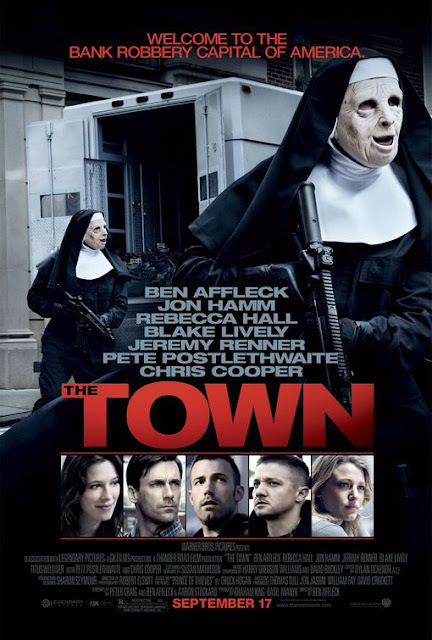 THE PLOT: Doug McRay (Affleck) is the leader of a second generation of bank robbers. The foursome confines their activities to Charleston, a section of Boston, known for its nefarious citizens. Their heists are meticulously carried out except for the loose cannon in all this, Jem (Renner), who is more violent and less careful than his three colleagues. When he takes a hostage from a bank robbery, (Hall), the die is cast. Although she’s released unharmed, Doug is convinced by Jem that she needs to be watched. And of course, the leading man gets to take on the task. His “watching” quickly leads to a romance. Meanwhile the FBI, led by Jon Hamm, are on the trail. Just one more job, as we’ve heard so many times in other movies. There are a few really riveting scenes here, especially where Renner is concerned. His performance in The Hurt Locker was no accident. You can’t take your eyes off of him whether he is detonating bombs or strutting around a diner. Chris Cooper does more with one scene than you’d have thought possible. Hall is excellent as the bank teller, but at the same time, the screen time spent on this romance undermines what the movie should have been about in my mind: the camaraderie and tension of this group of bank robbers, destined to take over the family business, like it or not. There are three long heist scenes. A million shots are fired between the cops (at close range) and the robbers, yet nearly no one dies until the very end. There is not enough tension in their final heist and the robbers seemed to be able to pull it off with almost no time to plan it. Jon Hamm is awful as the FBI agent, his accent came and went, and it seemed like he was urging his creative team to come up with a new ad campaign more than his FBI team to be creative in capturing these robbers. This is a decent film but I was fidgeting by the two-thirds mark, wondering if I would have to watch another shoot-out, wondering if anyone would ever actually die from a gunshot in this film. Wondering why I didn’t really care if Ben got the girl or not.